Everything But The Kitchen Sink: Tag: Why Do You Wear Make Up? I saw this post on Beth's blog Bird's Words and thought it would make a good post as I don't do many beauty posts so this can be my one for the week! 1. 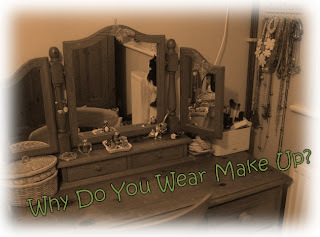 When did you begin loving make up? Hmm probably when my older sister started getting into it. She's give me the bits that she didn't want anymore so I'd be experimenting with them! Around this point me and my friends would be going into Boots and Superdrug and spend hours testing all of them out to find the perfect product! 2. How do you feel without make up? I feel more comfortable now than I would a few years ago. I've got into a good skin care routine and found the products that work well with me so feel more confident going without. I wouldn't not wear make up to sixth form or work as I don't feel comfortable without it! I'll always remember in Year 9 we were having our individual school photos and the teachers were handing out make up wipes to all the girls and checking that we actually took it all off! Not the best photo ever! 3. What do you like about make up? The fact that it can wake up my skin instantly! I love making my eyes look really big, so I focus on them the most when applying mascara, eyeliner and all of that! I'm really into mineral make up as I find that they're so good to my skin and don't clog it up as much as other products do! 4. Three 'Holy Grail' items? No7 Essentially Natural Mineral Foundation, a little goes a long way! GOSH Intense Eye Liner Pen, so easy to do! Benefit BAD Gal Lash, perfect for a natural look with no lumps! I really enjoyed this post and would encourage everyone to try this out, I'd love to hear everyone else's answers!